Reggie Bush is ready for a back to back championship! 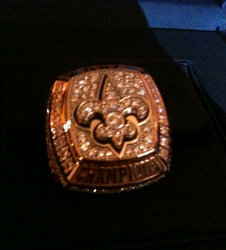 And here is something they can’t take away from him – how about his New Orlean Saint’s Super Bowl ring? Despite all the controversy and investigations from his career at USC, Reggie Bush is ready to get back to work and bring the city of New Orleans another – back to back – Super Bowl championship. New Orleans was a force to reckon with last year, taking down team after team in an nearly unstoppable rush that took them straight thru the Super Bowl. But do you think they have what it takes to win a back to back Super Bowl championsip? Reggie Bush seems confident it will happen!